Woodlands Family Theme Park in Devon provides a whole day of variety for all ages. The largest Family Theme Park in the South West has 11 action packed Zones with all weather family fun. Incredible indoor centres, outdoor adventures, Zoo-Farm, Falconry and Wildlife Sanctuary. No wonder families say it’s the best day out in Devon. You can take your whole family for an action packed day of fun at Woodlands Family Theme Park. With vast indoor centres nearly the size of two football pitches there is so much fun to choose from. Start the day exploring the largest indoor adventure centre in the UK. While parents relax over coffee in heated comfort, your youngsters can experience an amazing variety of challenges on five floors. 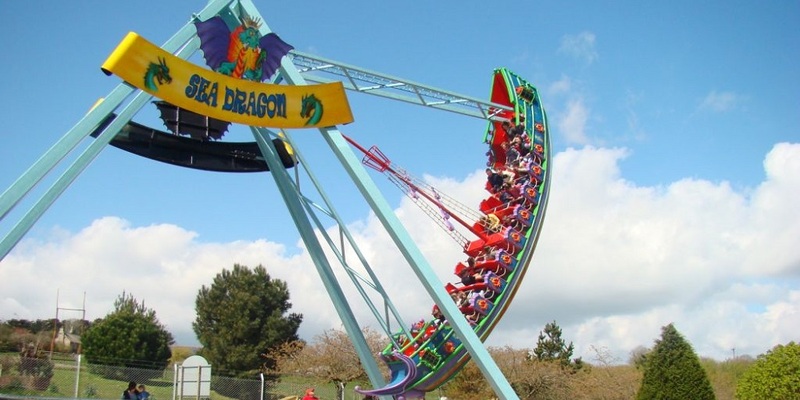 The Empire of the Sea Dragon has the highest and longest slides they have ever experienced. The Trauma Tower ride has a breath taking 50 ft drop, the Submarine ride is spinning fun and the Mini Ferris wheel is perfect for watching the high powered action and hidden adventures in the sky high nets and Towers. Downstairs the Ice Palace is the perfect fantasy play centre for little ones. All the family can be entertained in the Circus Drome and Master Blaster. Discover indoor junior action on the bouncy castle and Acrobats Challenge play centre, then ride the Circus Train past the prancing animals, and clowns while the Big Top Soft Play centre entertains the smallest members of the family. Get ready to blast balls from cannons in the two Alien Arenas in the Master Blaster and explode balls into space from the Volcano and other sneaky ball blasting devices. Don’t miss driving the man sized tractor round the Dinosaur Farm past the T-Rex and other giant creatures, while little ones practice their driving skills in Pedal Town. Exploring the indoor Seascape maze with a surprise round every corner is major fun. Outdoors there is still the sky high Swing Ship, for white knuckle thrills and the Playzones are open and ready for fun.Even rain on bitter cold days can’t stop the fun with five warm indoor barns at the 8 acre Zoo Farm. With over 500 animals to visit the whole family is kept entertained with the antics of the Meerkats, the cheekiness of the Coati family playing hide and seek and the charm of the sugar gliders as they glide from branch to branch. It’s warm in the Reptile house, cosy in the Nocturnal House and amazing in the Bug Show where you have the chance to handle a giant spider and other creepy crawlies. At Woodlands Family Theme Park, all the fun is included and there are no hidden extras. Complete a brilliant day out with warming food, and luscious hot chocolate to purchase in Rays Diner. More indoor entertainment is waiting in the fascinating Falconry Centre with its majestic Birds of Prey, although they don’t fly outdoors in the winter the highly experienced Falconers are full of fascinating facts and stories about the owls and predators in their care. Your family can even watch the exclusive web cam as Bonnie and Clyde, the tiny burrowing owls, play in their underground caves. Family friendly: Baby changing facilities are provided within the Park. Please see the Park Guide for their locations. Bottle and food heating is available in the Empire of the Sea Dragon.